Valentine interiors + design is very proud to be announced as a ‘Best of Houzz winner for 2019’ in the category of client service. We always aim to ensure our client’s are satisfied with the interior design and the customer service that we provide. When designing a kitchen or bathroom we always have an extensive briefing session with the client to establish how a client moves and functions within their existing space. This helps us to gain a clear picture of how the new design must function, as well as having a strong aesthetic appeal. We believe good communication and listening to our client needs forms the basis of a successful working relationship. We were thrilled to be selected by one of the writers, Niki Bruce, at Houzz to be featured in an article on their site, titled ’40 Gorgeous Kitchen Islands’. The article talks about the island bench being the norm and the hub of entertainment. The discussion about our kitchen design that was selected revolved around the use of a monochromatic scheme with the sink in the island bench. Please click on the link below to view the article. Photo credit: Loic Le Guilly. We welcome Hazel to our team at Valentine interiors + design. She has a vivacious way of designing, loves exploring new solutions, great with people and in her spare time is a volunteer for the Royal Duck Watching Society. We love having her on our team (although her work productivity is a little slow so far) and you may see her working on future projects with us…either side of her siesta. At Valentine interiors + design, we value a happy and enjoyable work culture. We believe a sense of humour and having fun is crucial to the creative process, resulting in a work environment that we are proud of. We wish everyone a Merry Christmas and thank you all for the ongoing support. Our office is now closed until the 7th January 2019. Please send us an email if you would like a consultation for the New Year. 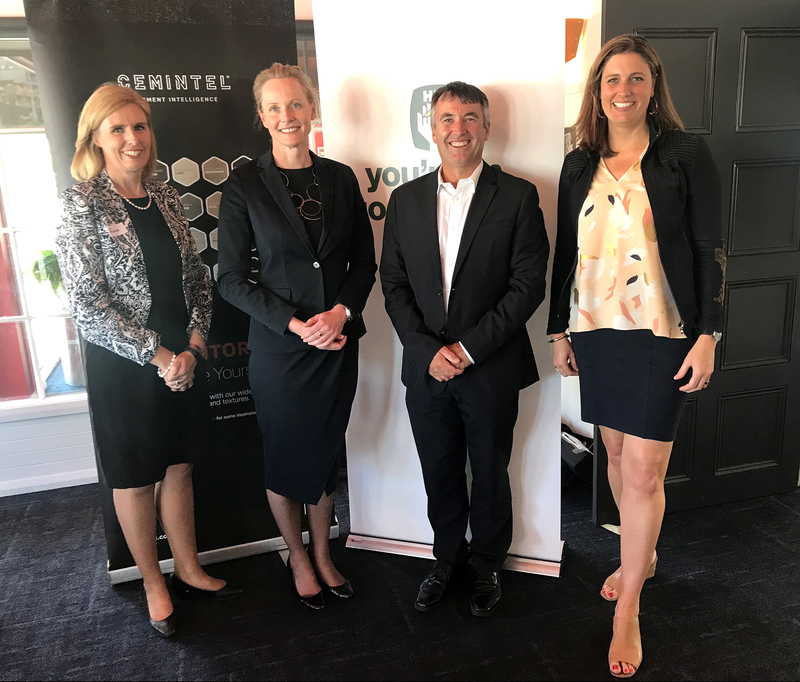 Jane Valentine was honoured to be invited to the HIA CSR 2018 Tasmanian President’s Luncheon to celebrate Women in Industry. The guest speaker Ally Bradley, the General Manager of Southern Cross Austereo gave a very inspiring talk about her journey to success. She was humble, entertaining and inspiring while providing an honest and raw account of her life. Jane could relate to the stories discussed over lunch about encouraging women in construction as she grew up in a family with a father for a land surveyor and manager of a building kit home business. Some of her earliest recollections were drawing on the back of house plans and walking on concrete slabs. There was lots of pink surveyors tape around the house, plans and building materials. She was encouraged to pursue a career of her choice…and ironically ended up in the industry too (and loving it). At Valentine interiors + design, both Jane and Sarah hope to encourage young women to pursue a career in the industry too. We were thrilled to be selected as finalists for three categories in the recent Tasmanian Housing and Kitchen & Bathroom Awards. It was a fabulous night at Wrest Point Hotel Casino on Saturday 20 October, 2018. Our New Town kitchen, bathroom and Lenah Valley kitchen were judged as finalists for the design categories. Entry photos below: Loic Le Guilly. Cover photo: Matt Thompson (courtesy of The Mercury). Valentine interiors + design recently expanded into a new design space located in Molle St, Hobart. A very spacious and inspiring studio, filled wth contemporary Tasmanian art. We love the new office, reflecting our style of work and providing a central location for our clients to visit. We stock a large range of samples and have a meeting room to display our work. Our meeting room has a presence…you will find yourself immersed in Tasmanian lichens. We look forward to sharing this with you in our next consultation! As the days get warmer here in Hobart, spare a thought for our client Stream Art Design who braved the cold by recently attending a conference in Antarctica, and kindly spreading the word of Valentine interiors + design to the locals. It was so lovely for our client to be thinking of us all the way from Antarctica…and what a great little customer! The penguin would fit in well with our black and white kitchens. 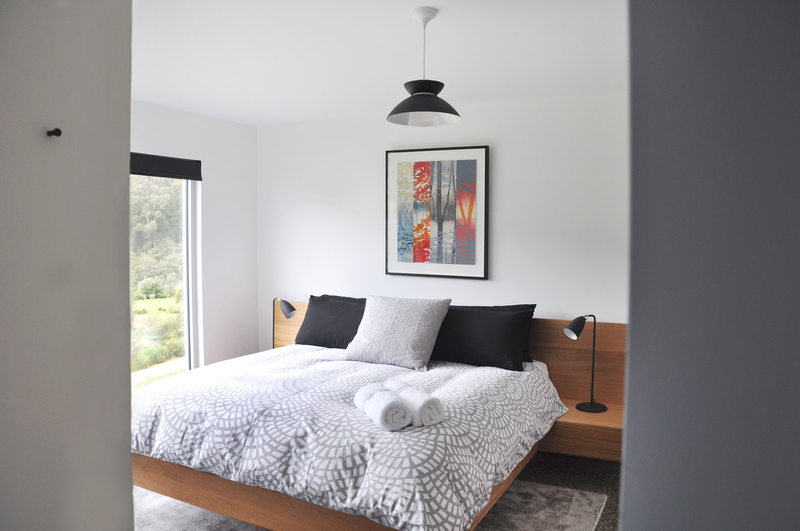 We will have to send our client back to photograph the stylish ‘nest’. It all happens in threes, so it’s time for Valentine interiors + design to celebrate our third birthday. Thank you for all your support, its been a fabulous three years. We love designing and making a difference to peoples lives through improving their surrounding environment. At Valentine interiors + design, we value a sense of fun and have worked hard to develop a friendly, enjoyable work culture. Looking forward to the years ahead with some exciting projects in store.